Japanese Episode AG 166: "The Usohachi Queen and Manene King!?" American Episode 436: "King and Queen for a Day!" As our heroes get off the ferry on their way to the Battle Tower, Satoshi and his friends are greeted by a pair who tell them that they've won a free massage! After strapping our heroes down on tables, the two strangers reveal themselves to be Musashi and Kojirou. A battle erupts inside the massage parlor and ends with the Rocket-Dan blasting off again. 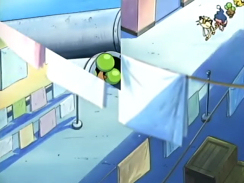 However, the explosion also sends Pikachu, Nyasu, Usohachi, and Manene blasting off! As Satoshi-tachi and Musashi-tachi search for their lost pokemon, a trio of black-suited men start to chase after Pikachu and the others. The pokemon eventually lose the men and wander onto the set of a TV drama, where the director spots the pokemon and begins to cheer! 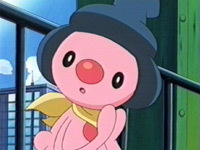 Apparently, the scene he was filming involved an Usohachi and a Manene, but the two pokemon who were supposed to be in the scene had run off! Musashi and Kojirou show up and convince the director to use Kojirou's and Takeshi's pokemon as stand-ins, so filming with the new pokemon begins. However, the Rocket-Dan are unable to resist jumping in front of the camera for their fifteen minutes of fame and are promptly kicked off the set. An angry Musashi retaliates by launching a battle but is thwarted when Satoshi and his friends arrive on the scene. The Rocket trio is sent blasting off, but the resulting explosion destroys the TV set! Can the director finish his scene? There's a phrase in Japanese, maa maa desu, and it pretty much means "so-so" or "alright." It's a very neutral phrase that's used when you don't have any strong feelings one way or another. With that in mind, this was a very maa maa desu episode. I mean, this episode had some good points, but it also had a lot of things that were just sort of "meh." The plot kind of lingers around in the middle (i.e. all those "Nyasu gets everyone food' scenes), making the ending rushed as hell. I guess there were some good parts to it (like Takeshi and Haruka having the same tastes in TV shows), but other that that...meh. 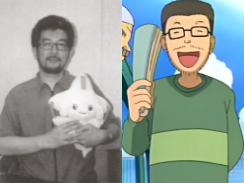 Random note: the director of the TV drama in this episode is a caricature of real-life Pocket Monsters director Kunihiko Yuyama. See the resemblance? The big thing about the dubbed version of this episode is the use of Gotta Dance. They pretty much mix the old VA's with the new in this episode, and the results are rather tacky, to say the least. And while we're talking about voices...what is up with that mustached worker? The one who dresses up as Mime Jr? His voice is so insanely bad that it almost makes Morrison sound like a real person! What the hell is up with PUSA and its love of casting "cartoon voices?" A one-second scene transition...thing is removed from the dub due to placement of a commercial break. It happens right before the part where Nyasu helps the pokemon get food. The dubbed version fades out to commercial before this transition can take place. First of all, the amount of music kept in the dubbed version of this episode is atrocious. PUSA kept four pieces of music out of the 22 pieces heard in the Japanese version, which is less than a fourth of the music. Just because people are saying that PUSA is keeping more of the Japanese music doesn't mean that they are. But the reason I even made a Music Edit heading is because of Gotta Dance. Now in the Japanese version, we hear the regular version of Polka O' Dolka that's used as the ending theme in those early Advanced Generation episodes. Well, since no regular TV version of the English version of the song exists, PUSA used the version heard in Gotta Dance, Whismur and all. While I'm no fan of Maddie Blaustein, it was still pretty tactless of PUSA to use her performance without at least telling her even though they have no legal reason to do so. The three seconds tacked onto the end of this episode are more obvious than in most because we go from the Advanced Adventure instrumental to a piece of English background music. Pretty obvious if you ask me.